China’s “Nuclear Option” In the Trade Wars Turns Out to Be a Dud. A global trade war is now in full swing. Many nations are involved, but the chief antagonists are the U.S. and China. China set up the conditions for a trade war by unfair dumping of steel on world markets and the theft of over $1 trillion of U.S. intellectual property. President Trump fired the first shots with tariffs on steel, aluminum, solar panels and dishwashers. China retaliated with its own tariffs. Trump answered back with further tariffs on $50 billion of Chinese imports. China then imposed more tariffs on U.S. goods to match Trump’s $50 billion. Trump raised the ante another $100 billion like a poker player with a good hand and lots of chips. At this stage, China can’t keep going with tariffs. They only import about $150 billion of U.S. exports. At the rate they’re going, they’ll run out of goods to impose tariffs on. Trump can keep going because the U.S. imports so much more from China than they buy from us. For China to keep fighting, they need an asymmetric response; they need to fight the trade war with something other than tariffs. This article takes a look at China’s holdings of over $1.2 trillion of U.S. Treasury securities. Some analysts say China can dump those Treasuries on world markets and drive up U.S. interest rates. This will also drive up mortgage rates, damage the U.S. housing market, and possibly drive the U.S. economy into a recession. Analysts call this China’s “nuclear option” when it comes to fighting a financial war with Trump. There’s only one problem. The nuclear option is a dud. If China did sell some of their Treasuries, they would hurt themselves because any increase in interest rates would reduce the market value of what they have left. Also, there are plenty of buyers around if China became a seller. Those Treasuries would be bought up by U.S. banks, or even the Fed itself. If China pursued an extreme version of this Treasury dumping, the U.S. President could stop it with a single phone call to the Treasury. That’s because the U.S. controls the digital ledger that records ownership of all Treasury securities. We could simply freeze the Chinese bond accounts in place and that would be the end of that. 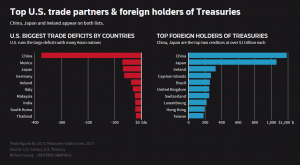 So, don’t worry when you hear about China dumping U.S. Treasuries. China is stuck with them. There is no nuclear option in the Treasury market.